Rediscover this internationally loved fairy tale with a variety of oz wearables and wizard of oz collectible goodies. Join the Celebration. You'll find all the Wizard of Oz Characters - Dorothy, Toto, Tin Woodman, Cowardly Lion, the Scarecrow, Glinda the Good Witch ... all of Oz. These ever popular character products are sure to delight kids of all ages and those who are young at heart! Wizard of Oz Collectibles based on and Celebrating the 100th Anniversary and The Wonderful Wizard of Oz. 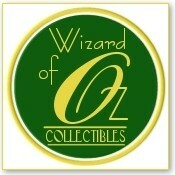 This Wizard of Oz Collectibles site owned by Oz Central. Designer Furniture Showroom bakers racks, bar stools, bistro pub tables, pedestal tables, curio cabinets, home & garden decor accents and accessories. At Designer Furniture Showroom, We offer many home and garden decor items in our Garden Art Collection to turn any indoor or outdoor space into a work of art.